Kanin tells the President that Almeida is being transferred to FBI Headquarters. The Secretary divulges that Juma’s right hand man, Ike Dubaku, is behind the whole thing. Allison listens to a tape from Dubaku. Dubaku gives ultimatums. A White House official says it will take six days to put a new defense system together. Allison says that they need to get info out of Tony as soon as possible. Tony is brought to FBI headquarters, followed by Jack and Renee. Moss is angry with Renee. Renee says the FBI has been compromised. Jack explains the situation. Jack says that they need to talk to Tony. Moss warns that he needs to be in on every decision. Janis puts electrodes on Tony. Renee and Jack are watching Almeida from another room. Renee tells Janis that they are worried about a security breach, so there is going to be a lockdown. Janis looks frazzled. Sean questions the lockdown. Almeida’s men talk about Tony. They realize that the FBI has Tony. They decide to give the US more time to get the troops out of Sangala. Moss tells Renee and Jack that Almeida is helping Juma. Jack insists that he speak to Tony. Moss finally agrees to the visit. Jack tells the guard to leave. Jack asks Tony how he can still be alive. Jack discloses that the FBI knows Tony is working with Juma. Jack pleads with Tony. Tony is resistant. Almeida explains that he is doing all this for the money. Tony says some cutting remarks about Jack’s dead wife, which makes Jack lose it. Jack grabs Tony’s throat and demands to know where the CIP device is. Tony whispers a number in Jack’s ear. Jack leaves the room. Bauer makes a call, using the numbers Tony whispered to him. Jack is surprised when Bill Buchanan is on the other line. Bill tells Jack that they need to talk. Chloe O’Brian is with Buchanan. Chloe talks about Tony going undercover again. Henry returns to the White House. Kanin tells Henry to give up on the investigation into Roger’s suicide. Henry is adamant that Roger wouldn’t take his own life. Kanin reveals that Roger was being investigated for insider trading. He adds that Allison knew about this. Henry is mad that he is the last to know the truth. President Taylor talks to Kanin. Allison says that Tony is not cooperating. Allison doesn’t know what to do. Kanin says that they should withdraw troops to protect Americans. Allison disagrees. Chloe gets a secure line so Buchanan can call Jack. Bill says that Tony is undercover to infiltrate the FBI, where someone is aiding Juma’s regime. Buchanan says that he needs Tony back pronto. Chloe speaks to Jack. Jack says that Renee can help them, but Buchanan doesn’t like the idea. Jack says he will take care of Tony himself. Janis asks Sean about a file, but he is preoccupied. Sean is acting suspicious. Henry receives a call from Sam. Henry apologizes. Sam reveals that Roger was murdered. She asks to meet Henry alone. Moss wants Almeida to talk, but Tony refuses. Almeida says that his conscience is clear. Tony keeps looking at the camera. Renee tells Moss that Tony is never going to talk. Renee brings up a torture tactic. Moss says absolutely not. Moss wants Jack removed from FBI Headquarters. Janis says that she found a leak. Renee prepares to debrief Jack. Janis checks a mainframe computer, where it shows that someone accessed classified files recently. It happens to be that Sean checked the FAA database. Janis thinks that Sean is working with Tony. Sean explains that he was only checking up on his wife, who is aboard a flight. Janis is irritated, but relieved that Sean isn’t a mole. Chloe gives Jack info on how to get out of the Headquarters building. Renee tells Jack that he is no longer needed. Renee asks Jack to sign a release form. Jack grabs Renee. He says that she shouldn’t fight him. Jack grabs Renee’s gun, earphone, and keycards. Chloe tells Buchanan that Jack has Renee’s items. Jack enters the interrogation room with a gun. Moss complies and drops his gun. Moss asks where Renee is. Tony kicks the guard. Tony and Jack leave the room. Tony apologizes for the harsh words he said about Jack’s wife. Janis tells Sean that she fixed the problem. Janis sees that someone is hacking into their surveillance system. Chloe guides Jack through the building. Chloe loses her feed. 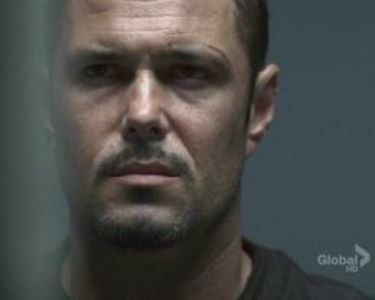 Sean and Janis see the interrogation room feed, where Moss is on the ground. An alarm goes off. Jack tells Almeida that they need to hurry. Chloe apologizes, but unfortunately can’t get back into the system. Jack and Almeida hide from some guards. Moss asks his team to find them. Renee asks Larry if he’s okay. Janis says that she found Jack and Almeida and that they’re in a stairwell. Moss radios in to the guards. Chloe is able to break into the system and warns Jack. Jack breaks a window. The two jump out. Chloe says that Bill is waiting for them in a blue van. There is gunfire. Tony jumps down from the parking garage while Jack keeps shooting. Jack hotwires a car. He put the car in drive and flies off the ramp. Tony shields Jack from gunfire. An agent tells Moss that they got away. Chloe is watching the feeds. Bill promises that he will tell Jack everything when they get to safety.